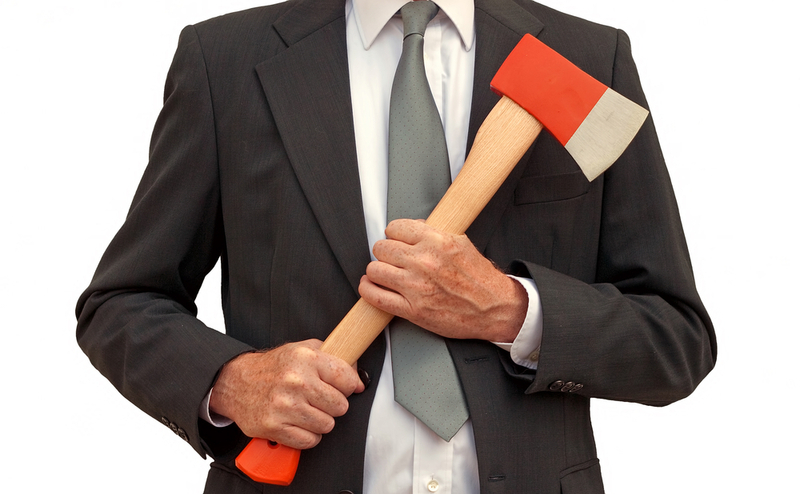 Who wields the axe at the Crofting Commission? Following the revelations of the Upper Coll Common Grazings Committee being removed from office by the Crofting Commission in a “dictatorial, vindictive and unjustified“ manner there came news that this was not an isolated incident. The Mangersta Common Grazings Committee has also been removed from office by the Crofting Commission. Members of the now defunct Grazings Committee have referred to the Crofting Commission’s behaviour as “erratic, overbearing and contradictory”. They have called on an inquiry into this “appalling” situation. The facts surrounding the Mangersta ‘sackings’ related to payment of monies to an absentee crofting tenant who had returned cheques sent to him. On any reading of the situation, as disclosed in the press this past week, the actings of the Commission and their Convener appear almost beyond belief. The only cheep so far on any of this from the Crofting Commission is a blog post which they state to be a reminder on the ‘The Rights of Crofters and the Duties of Grazings Committees and their Grazings Clerks‘. This ‘reminder’ is unfortunately misleading and inaccurate. It is recommended that crofters don’t follow it but seek independent specialist advice. Donald Macsween (a crofter in Ness on the Isle of Lewis) has blogged on the “nonsensical” and “totally impractical” stance by the Crofting Commission on the financial management of grazing funds. He makes some very astute and sensible points. Ones that appear to be lost on the powers that be in the crofting regulator’s HQ at Great Glen House in Inverness. I am likely to return to this topic on a future dedicated blog post covering it in some detail from a legal point of view. Scottish Labour’s candidate for Na h-Eileanan an Iar/Western Isles, Rhoda Grant, has backed calls for a full inquiry into the workings of the Crofting Commission and the reinstatement of Upper Coll Common Grazings Committee. symptomatic of a much wider problem with the Crofting Commission which has gained an unwelcome reputation for its high-handed, overbearing attitude towards good people doing their best to hold crofting together. The whole system of crofting tenure is in a very parlous state and it needs the support of a regulatory body which acts firmly and fairly in the crofting interest. Instead, we have a bull-in-the-china shop approach which is undermining the work of well-run crofting villages, for reasons that seem to be random rather than for any consistent, coherent reason. The Crofting Commission is a creature of statute and nobody is empowered to behave as a law unto himself. There must be an urgent inquiry, relating to Upper Coll and also more generally, to find if the Commission has acted beyond its powers and whether its recent behaviour is consistent with the interests of the crofting community. Every single one of the eight commissioners should be aware that this crisis is now their responsibility. They must take it upon themselves to resolve a serious situation before suffering the ignominy of ministerial or even legal intervention. What on earth is going on? How many others are there who have been intimidated and bullied into submission under threat of removal? It is clear that there has to be a review by the Scottish Government of how the commission works and what its objective is. The Scottish Crofting Federation yesterday issued open letters to the Crofting Commissioners and to the Minister for the Environment, Climate Change and Land Reform. They call upon the Crofting Commission to make a public statement on what is behind their actions. They request the Scottish Government to carry out “a full review of the situation as soon as possible before the damage is irreversible”. It has been stated that “crofters are so intimidated by the Crofting Commission that they will not speak out publicly“. Now that some crofters are actually beginning to do so hopefully more will tell their stories. From what I can see this is the crofting worlds equivalent of the ‘Panama Papers‘. There is likely to be many more revelations on the actings of the Crofting Commission surrounding ‘Common Clearances’ and other crofting issues. In 1883 a Royal Commission (The Napier Commission) was set up by Gladstone’s Liberal Government. Its purpose was ‘to inquire into the conditions of the crofters and cottars in the Highlands and Islands of Scotland’ and everything concerning them. This came on the back of The Highland Clearances and ‘The Battle of the Braes’ where the Braes crofters stood up against the 50 policemen brought in from Glasgow following the loss of their hill pasture on Ben Lee and a rent strike in protest. The Report by the Napier Commission resulted in the first Crofters Act in 1886 providing security of tenure for crofters. 130 years after security of tenure was given to crofters a new form of clearance is happening in the Highlands and Islands: The clearance of common grazings committees by the Crofting Commission. They are wielding power in an unjustified and brutal manner reminiscent of landlords from the nineteenth century. We are about to see I believe ‘The Battle of Great Glen House’ (this time perhaps fought with paper and ink rather than stones) and the Scottish Government must now institute an inquiry into the actings of the Crofting Commission and everything concerning them. This entry was posted in Common Grazings, Crofting Commission and tagged absentee crofting tenant, Catriona Maclean, Chief Executive, Chief Executive of Scottish Crofting Federation, Chief Executive of the Crofting Commission, Colin Kennedy, Common Grazings, Convener, Crofting Commission, Crofting Commissioners, Donald Macsween, Grazings Clerk, Grazings Committee, Great Glen House, Highland Clearances, Mangersta Common Grazings, Mangersta Common Grazings Committee, Minister for Environment Climate Change and Land Reform, Panama Papers, Patrick Krause, Rhoda Grant, Scottish Crofting Federation, Scottish Government, The Battle of Great Glen House, The Battle of the Braes, The Napier Commission, Upper Coll Common Grazings, Upper Coll Common Grazings Committee, West Highland Free Press, WHFP on April 30, 2016 by Brian Inkster. An excellent and true reflection of what is taking place. What has to be established is the “part” Mr Kennedy, Convenor has played in this! He was the subject of a formal complaint levelled by 4 shareholders of the Upper Coll Grazings as to his conduct whilst chairing a meeting between the CC and Upper Coll Grazings. This was still in process as he sat in “judgement” at a Meeting of Commissioners on 9 December 2015. Ms Maclean, the Chief Executive (His Junior!) conducted the inquiry into the complaints and was still in the process of doing so during that time as the Shareholders did not receive a letter of her findings until 23 December. Why was he still involved in the Upper Coll case when he obviously had an interest ie a vendetta against Upper Coll Grazings Committee?? I would have thought that in such circumstances the Convener should have declared a conflict of interest and taken no part in the decision making process pending the outcome of the complaints procedure. From where I come from a couple of individuals have run our common grazing for over 30 years, in the believe they did a good job for all, but also this is and was not true, on the face of it it does look true but underneath was a cloak of nepotisum, cronyism and favoritism. The book keeping has been hidden, any voice who dares raise an opinion is shouted down in a minister like manner. Any form of interaction with other outside the committee is absolutely not tolerated and from my point of view is akin to communism. The reality is the sheep pens are derelict, the sheep dip illegal to use, the hill tracks in poor repair, nobody does peat cutting because the “committee” do not want excavators on the hill, even though SNH have published a comprehensive pamphlet on best practice regarding hill management. Additionally to this there is still the land lord versus the poor crofter stance which is out of date, time wasting, selfish, and above all hold back progress of getting the hill, track, loch etc kept in good order because one or two people hold a long term grudge against past land lords who we can all admit did little for the tenant crofters, but why is this still played out when new land lords with huge sums to invest in the land can the grazing committee not make polite and professional contact with these people. The solution is that the grazing committees hold open meeting for all tenants to attend, make minutes that all can read and accounts like any normal business is done yearly and a copy either sent out to each member, within 6 months of the year ending with a summary of the years activities, investment in infrastructure and the next year plans. In this day and age there can be a website, text messaging etc and the one main point is one person has to get fair remuneration (pay) for the work they do to document the common grazing books and responsibilities. Our grazings committee, which is the one dismissed, has nearly always held meeting which all shareholders could attend. There are comprehensive minutes, annual statement of accounts, all agreed, minuted and approved at subsequent meetings. We elected two new younger members onto the committee last year to ensure continuity and experience gaining. The accounts are accurate, have proved to be accurate but not acceptable to Kennedy’s Commission. These books have been shown to many since this controversy arose. The figures are there for anyone to see. The particular ones they claim aren’t there are there for anyone to see. So Malc our committee was exactly the way you suggest. All recorded, above board, every single action accounted for, new members included ….what do they really want? Mass exodus of committees. That will be the result. Would that be the hidden agenda? Your reply is excellent news, from the face of it a well run committee, like ours but ours and I am sure many other which the commission is trying to shake up is not run in such a manner. When I complained about our committee, I was verbally told by a commission member that this unfortunately is a common problem! But to be frank the crofting rules are so ambiguous that we can all read them in every which way and come to completely different opinions, which is really the heart of the problem. With rules like this from the commission whats the point of it. It should be a self governing body. Not a talking shop. You are absolutely right, I agree – your common grazing committee has every right to make a case vs the commission and that is the only reasonable way forward.